Are you ready to get creative?? 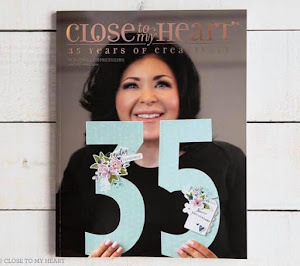 Let 40 talented CTMH consultants inspire you with their creativity this month. 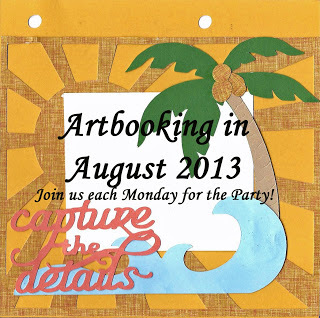 Each Monday in August, these ladies will be posting artwork to their blogs and you do not want to miss it!! (subscribe via email to ensure you don't miss the action). If you came from Marie's blog you are on the right track. I can't believe the last Monday in August is already here!! This month has gone by way to fast but I had a blast sharing some fun things you can create using the new Artbooking cartridge. My final project is a mini album using Laughing Lola. I can't begin to explain how easy it is using this cart. It is fool proof!! This is the cover. I set my dial at 8 and began to cut. The pages through out the album were cut from pages 48 & 49 which is the 8x3.5 Love Mini Album. I wanted the cover to stand out so I have a picture mat as well as I thought some texture would be nice so I used the "Dream Pop"(retired) paper pack for the overlay. Using page 48 I used the title, photo mat 1, overlay key. 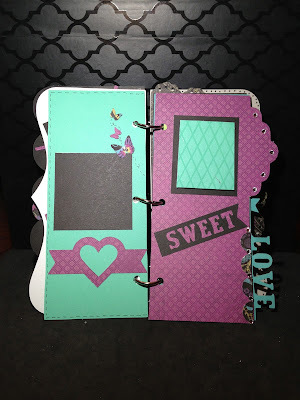 The left page I used the border cut from page 49. 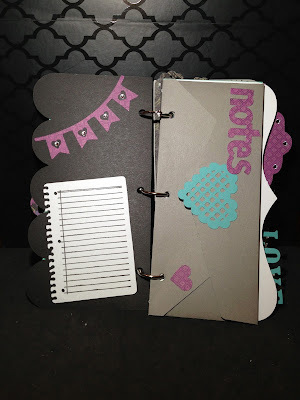 I cut the notebook paper using Overlay from page 42 and stamped the lines using the Artbooking stamp set using black ink. This is a fun journaling spot. The right side I used pg 48 Shift Lock > Photo Mat 1 which is this cute envelope which opens up. 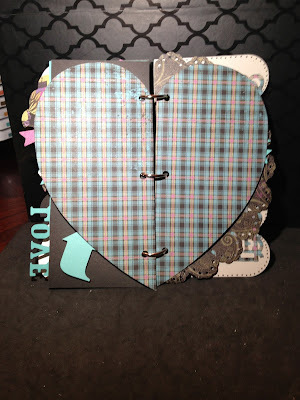 I am thinking a confidential love note can be put in here. I cut out the heart using the Shift Lock > Border key. I cut the "notes" sentiment from pg 44 Title key. The heart comes from the inside of another cut. 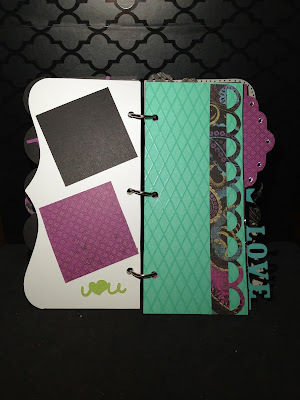 I used the strip from the Laughing Lola paper on the left page. I added the cute "I <3 U" word bubble using the Title key on pg 78. On the right side the photo mats are from pg 49 using the Icon key. 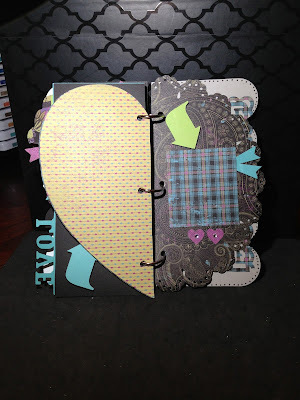 I added two photo mats to the left side page and the inside piece from the "I <3 U" word bubble in the previous picture.The right side I added a border from pg 48 using this funky fun patterned side of this paper. I added photo mats to both pages. I cut out butterflies from my Martha Stewart punch and but a bitty sparkle in the center of the largest butterfly. I used pg 49 Title key to cut the "Sweet" banner and pg 61 for the heart shape using the Icon key. The left side I used pg 74 Shift Lock > Photo Mat 2 keys. It was a little bigger then I anticipated but if fit since this page had a funky shape which is larger at the top of the page. I love the right side page with the word "love" cut out. I used pg 41 to help me decorate it. The film strip was cut using the Border key. The sun shape with the heart was cut using the Icon and Shift Lock > Icon key. The green arrow came from pg 79 using the Title key. 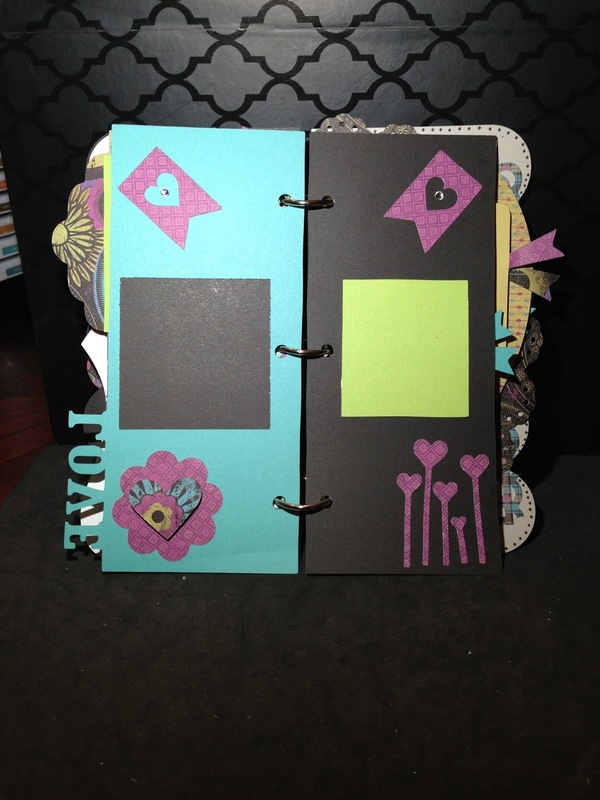 I added photo mats to both pages. The banner flags with the heart center are form pg 61 Shift Lock > Icon key. I add a bitty sparkle to the center of each flag. I used the flower from pg 48 Shift Lock > Icon key. 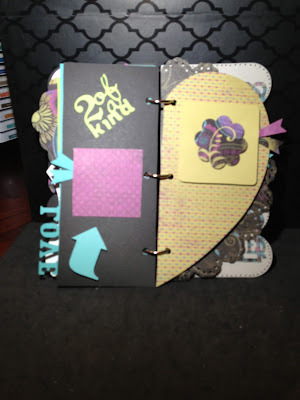 I added the heart from the center piece from a cut out on one of the other pages. The heart trees on the right side is cut from pg 49 using Shift Lock > Overlay key. The left side I added a photo mat. The arrow was cut from pg 79 using the Title key. The flag behind the photo mat was cut from pg 44 using the Shift Lock, Icon key. How cute are these little flags??!! The "2 of a kind" cut is from pg. 78. The photo mat of the right side came from me cutting the image on pg 44 Photo Mat 2 however it was too big so I used the inside piece and put a flower in the center. I decided to keep this blank without any embellishment because I really like the heart shape. I figured I could always go back add if I changed my mind. I added a photo mat, the arrow, flag and two hearts from the inside cut of other embellishments in previous pictures. Last but not least the final pages. I love the overlay on the right side cut from pg. 49. I hope you enjoyed my mini album. 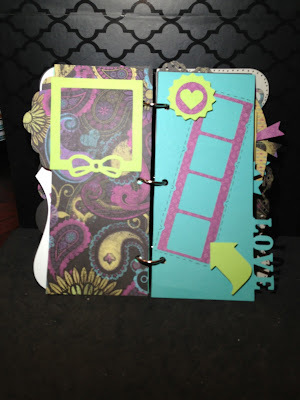 To continue on this hop please visit Traci's blog to see her wonderful creation! Thank you for stopping by and Happy Crafting!! You can click here for a complete line up if you get lost along the way. Fun album, Shalana! Great job in displaying and describing all the elements. Thank you Maureen. I can't get enough of Laughing Lola! LOVE those colors!!! 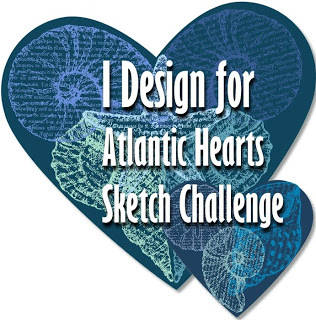 You put a LOT of work into this and love all the details you pointed out! AMAZING! Love the Dream Pop/Laughing Lola combo. I never thought about putting the two together. Thanks for the inspiration!! Very cute. Lots of fun color. Great mini album. Love the colors. Very classy! WOW!! 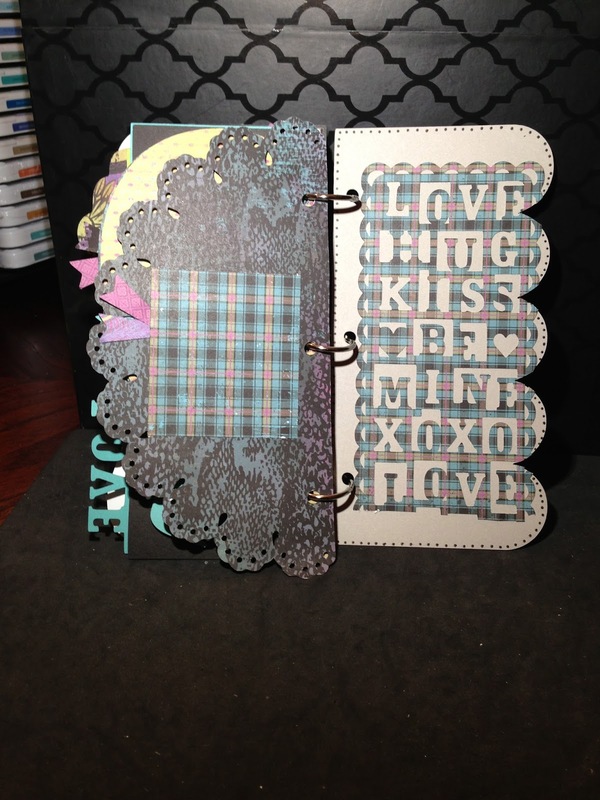 Simply gorgeous - I love how you included the one page form the Dream Pop collection - the color is perfect! 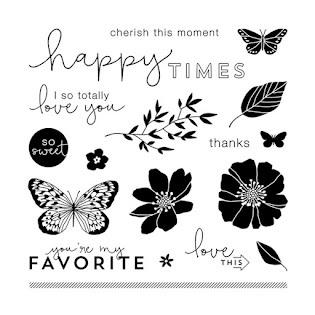 Thank you sooo much for participating in this first time ever blog hop. All of your artwork was stunning! Great job, girl! I love this album and the color combos. They are bright but look really elegant. Thank you Betty! The bright colors capture my eye.